Reading what my thirteen-year old friends wrote in my book so many years ago, are you all laughing and thinking how much more sophisticated you were at that age? 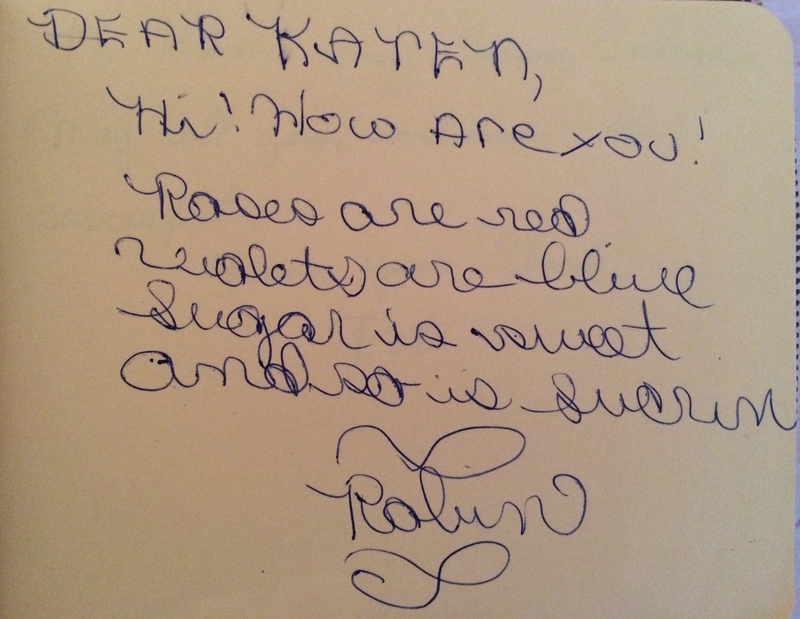 Earlier this week I discussed the “Roses are Red” autographs and today I will talk about the others. 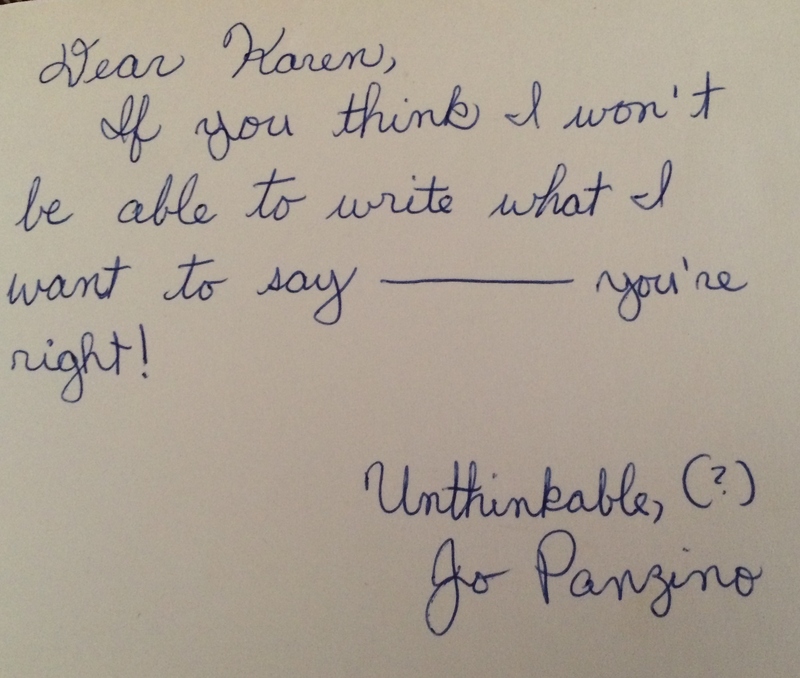 Apparently my friend, Jo, who I remember as being the best artist in our class with the shortest walk to School Street School (She lived across the street so she could sleep late), had thoughts too scandalous to write about. What a polite young lady she was. I wonder if she would like to weigh in on her past words today. Jo?? I was extremely gawky and skinny at that age. Grandma was constantly telling me to stand up straight and to take smaller steps. 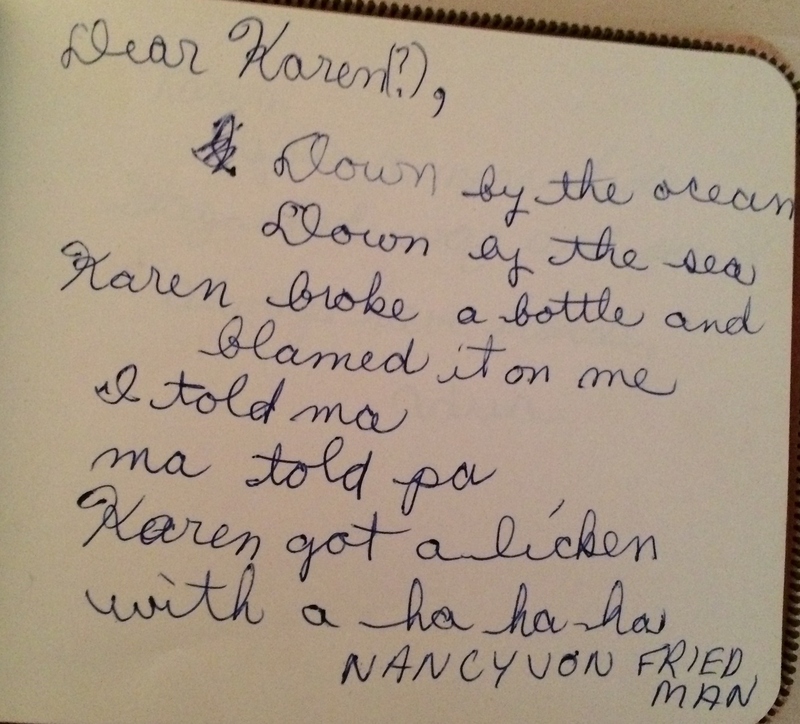 I towered over my siblings, so I suppose that my friend Kathy was just being honest when she wrote her “funny” poem to me. All the girls thought our math teacher, Mr. Hennessey, was so cute. He was single, as was a female math teacher, so my friends Karen, Mary, and I used to stalk them as they went over to the high school together for lunch, wrongly believing a romance was in the making. How shocked we were when Miss N. became engaged to a teacher at the high school. 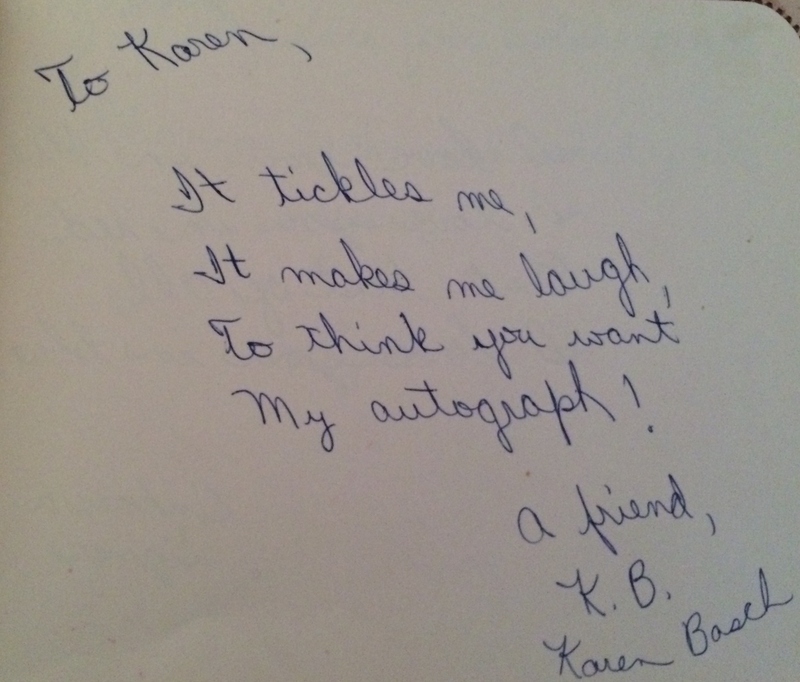 You all know Karen—my very first friend who is still my friend to this day. This was a friendship which began in kindergarten. Her poem was cute and showed she was happy for the opportunity to be immortalized in my book, but she never indicated how long we had known each other at that moment. 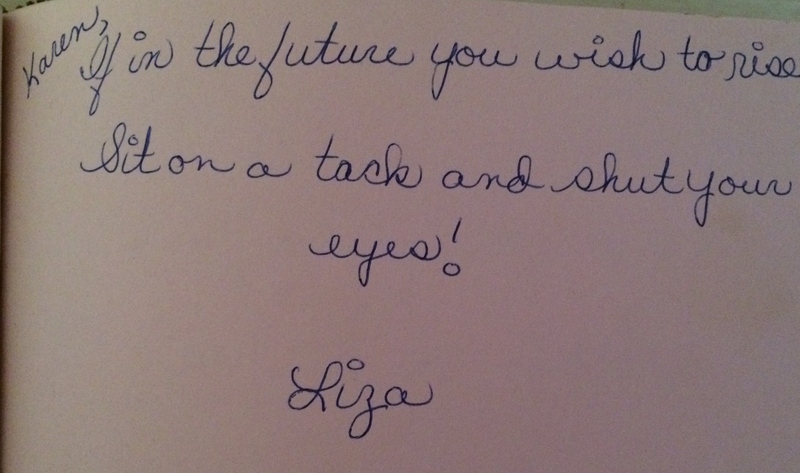 How about this poem from a girl named Liza? 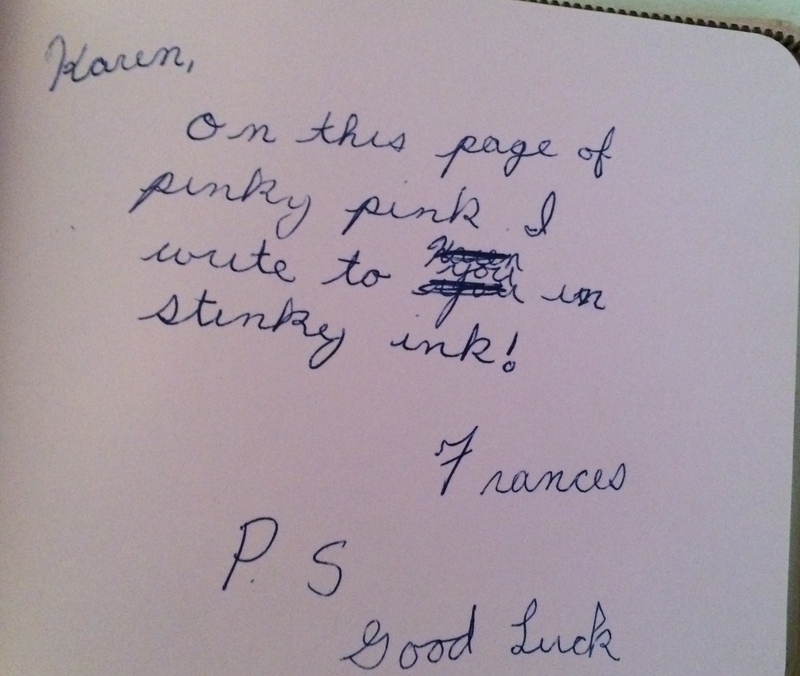 We were not close friends, but nevertheless, her seventh-grade humor graced the pages of my book. She should have gone into show-biz! 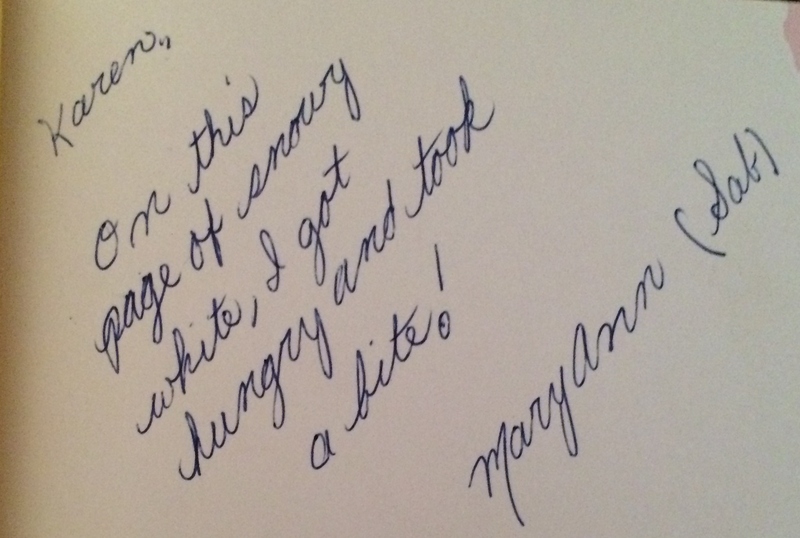 Sweet Maryanne D! She was the cousin of my fourth-grade crush, Joe, but that never helped to advance any chances of a romance with him. Nancy “Von Friedman” was not her real name. She always had a sense of humor as you can see from her post. Nancy was the friend who attended the USC Journalism School and has gone on to write two fascinating books on the topic of the paranormal. I enjoyed both books. She writes under the penname “Louisa Oakley Green.” Check her out if that subject interests you. 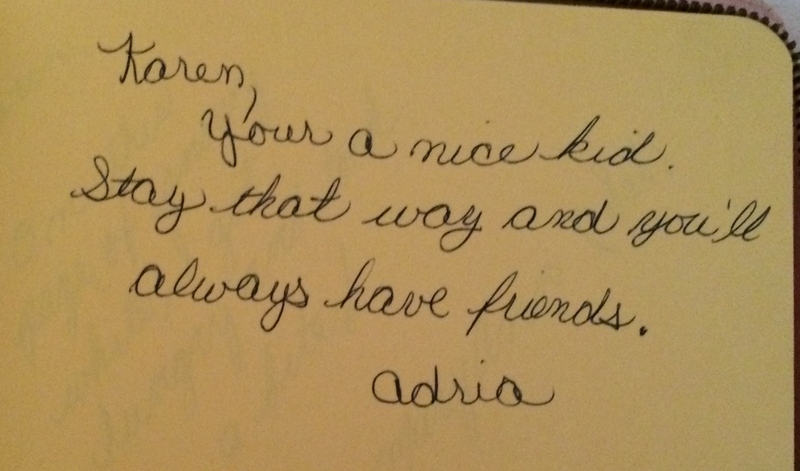 Adria was a very pretty, quiet girl who I knew from my days at School Street School. 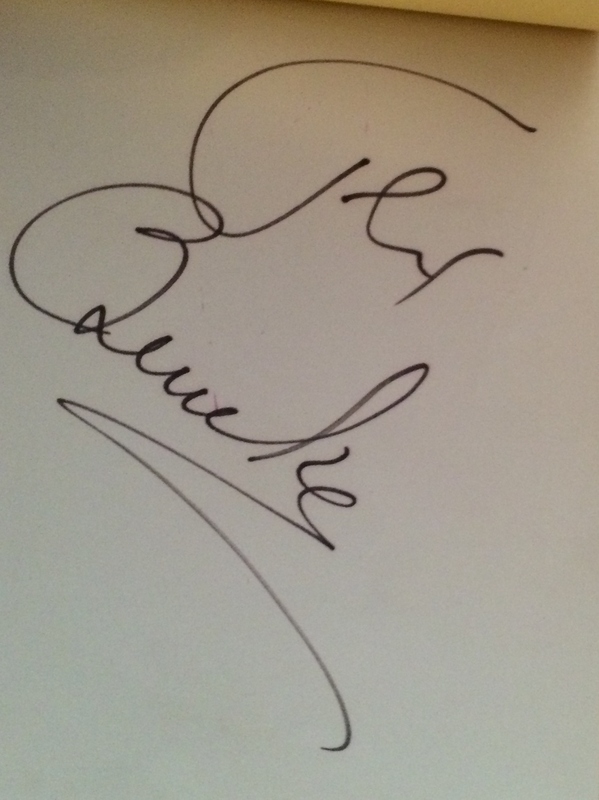 The simplicity of her autograph reflects her sweet personality. 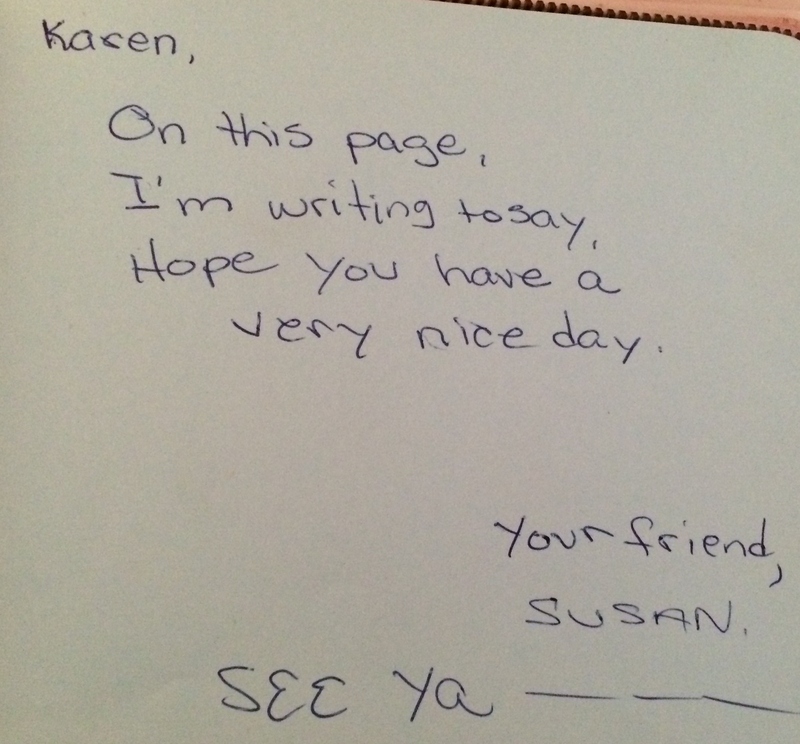 Susan was another friend from elementary school. I remember spending many happy days playing at her house with Karen. I think she had some kind of tree house. Your thoughts, Karen? 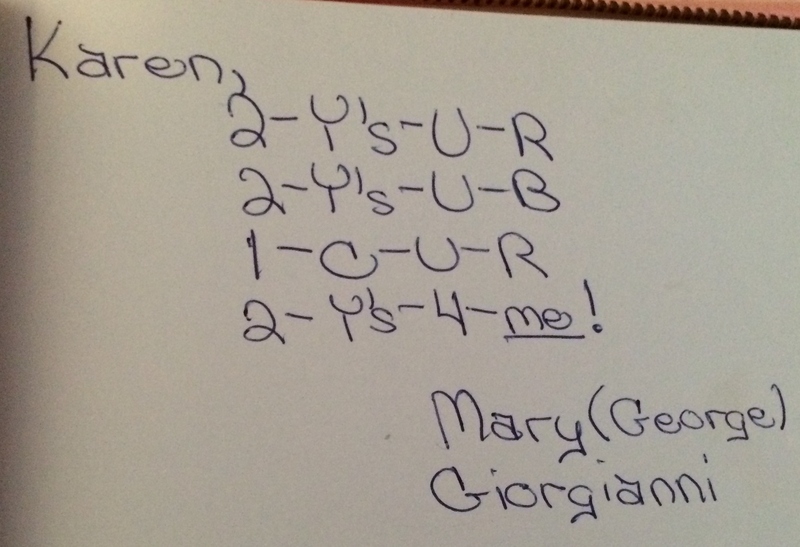 My mathematic-teacher-stalking friend Mary wrote twice in the book. It is ironic that both of her posts contain numbers. Aunt Ar is still friends with Mary’s sister Linda. I will see if she followed a career with any mathematics connections. Frances was the daughter of a nurse, who served as our Girl Scout leader at one time. 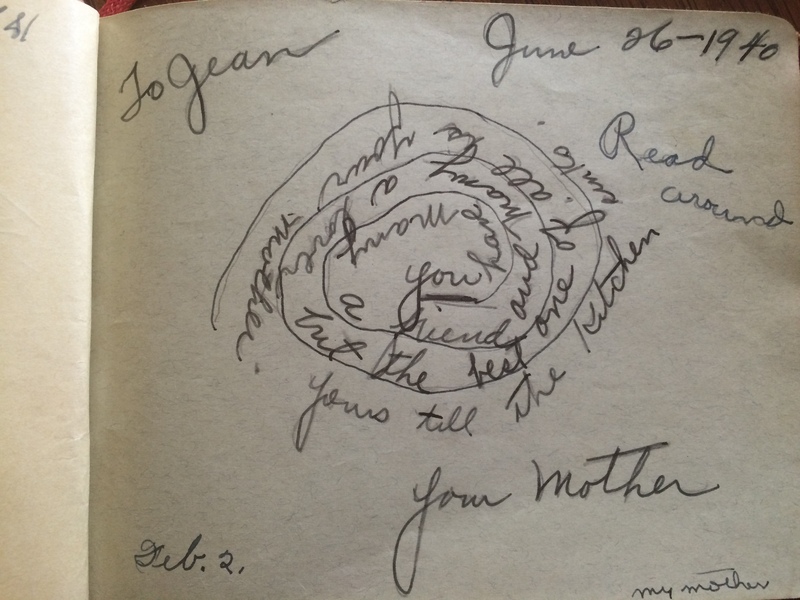 You will see a similarity between Fran’s poem and that of Aunt Ar—both references the color of the page on which they wrote. So that’s my autograph book. Thoughts anyone? I wonder when kids stopped doing this. How much did children change from Grandma’s generation to mine? Based upon our two autograph books, I would say that the differences were minor. 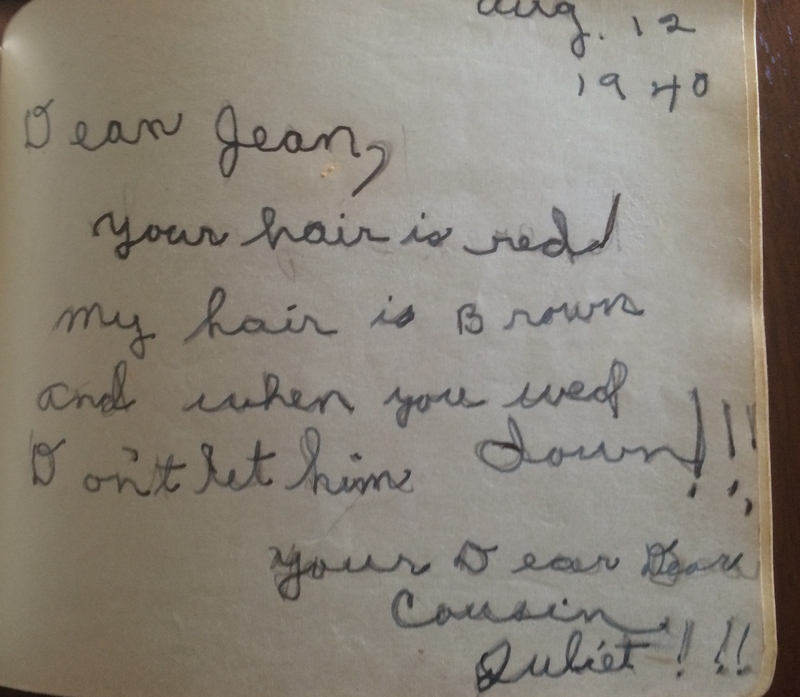 Upon examining what my friends wrote to me in 1968 when I was a seventh grader and what Grandma’s pals/chums (that’s what they called each other) wrote when they were in fifth and sixth grade, I observed that bad poetry was a constant in both. 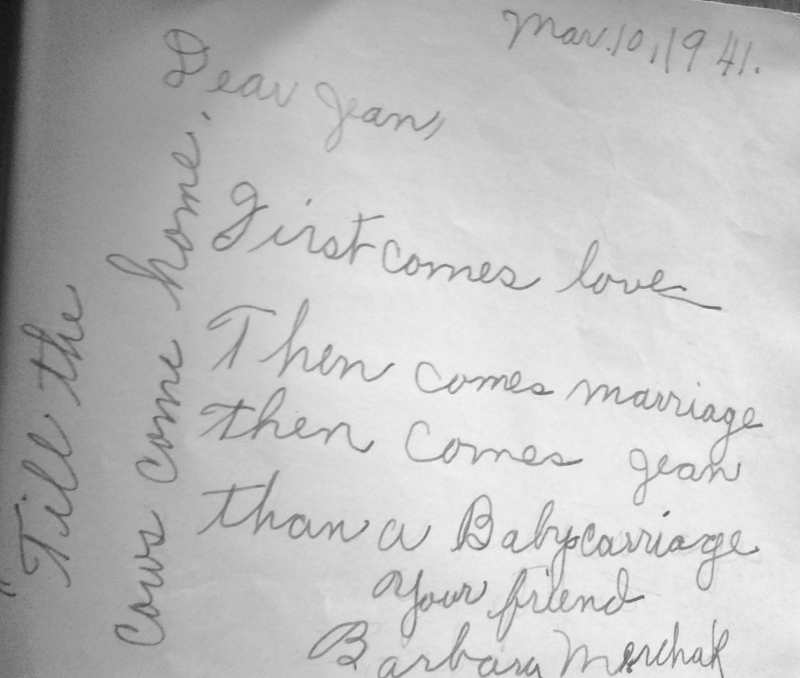 I smiled when I opened the book and saw that the first entry was written by my grandmother, who had lived in the house next to us for many years. When she wrote her poem to me, she was living with Aunt Marian and recovering from a twenty-eight day hospitalization for a ruptured appendix that nearly killed her. 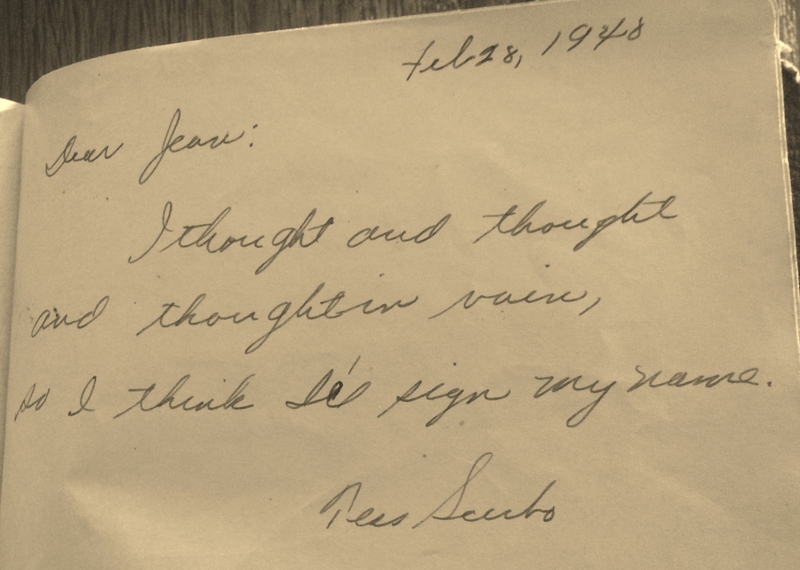 A few pages later I saw an autograph from Grandpa’s brother, Pete, who was visiting us from California. That may be the only time he visited us. I never understood why, after being separated from his family for so many years, Uncle Pete moved to the other side of the country. I had a huge appetite as a kid and was known to eat as many as four hamburgers (dipped in applesauce of course) at one time. Grandma would encourage me to snack before supper, hoping it would spoil my appetite. I guess that explains what she wrote to me. Sadly, Grandpa did not sign my book. 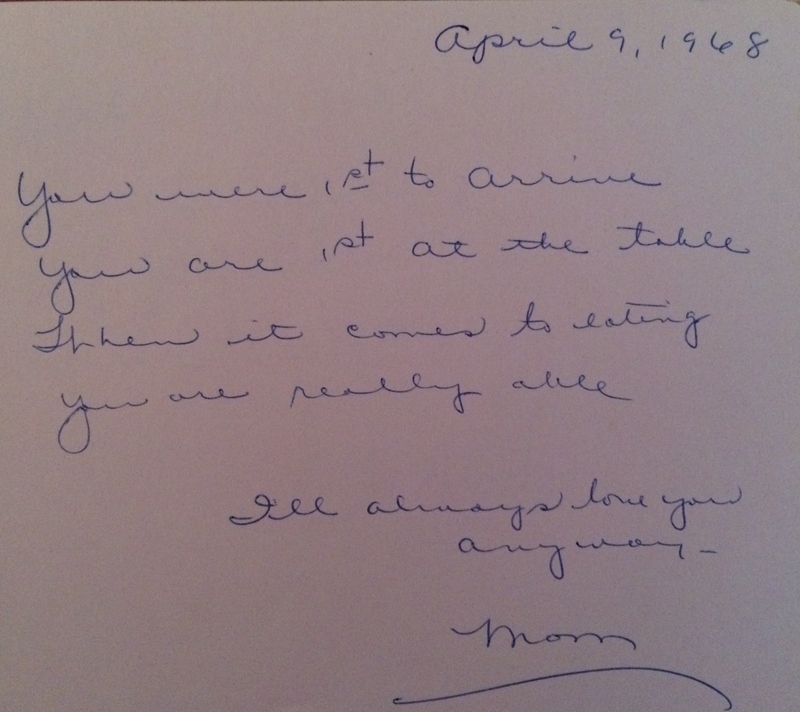 Aunt Ar was my only sibling to grace the pages of my zippered, pink autograph book. Jamie will not like the poem she wrote to me, because it clearly shows that my nine-year-old sister felt that teachers were overpaid. Among my friends, roses, rather than love and marriage, was the favorite topic. It was discussed by 25% of my junior-high friends, each with their own twists of the popular poem. 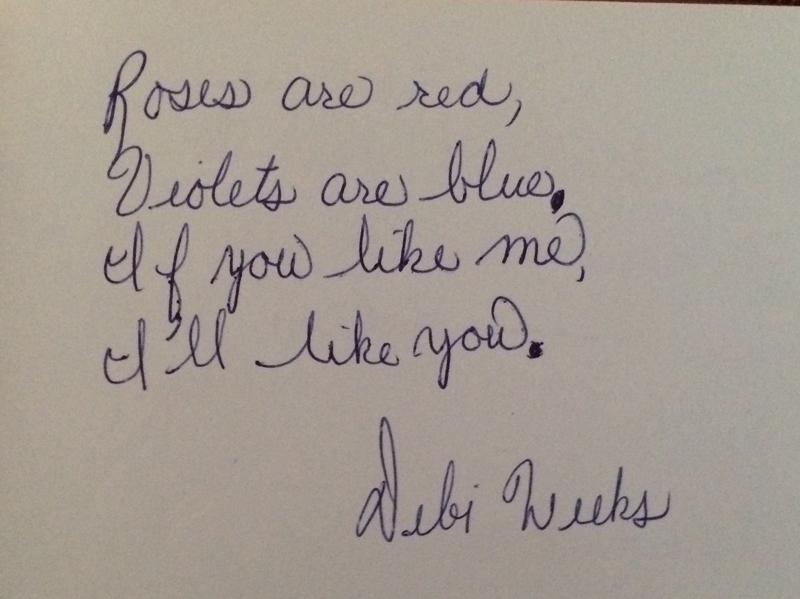 Debi had conditions on our friendship with her take-off on the famous poem. 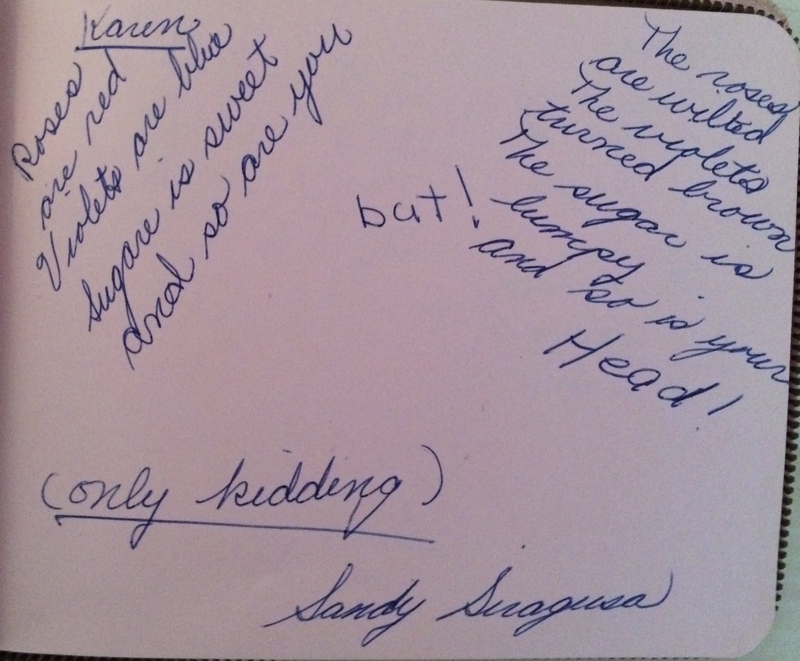 Sandy, who was the friend who had the first sleepover I ever went to, where I was levitated by some of the other girls at the party, wrote a more unfriendly take-off of “Rose are Red.” She did apologize, though. She wrote on a second page, but this time, she mentioned bourbon (Four Roses) in her clever little arithmetic post. 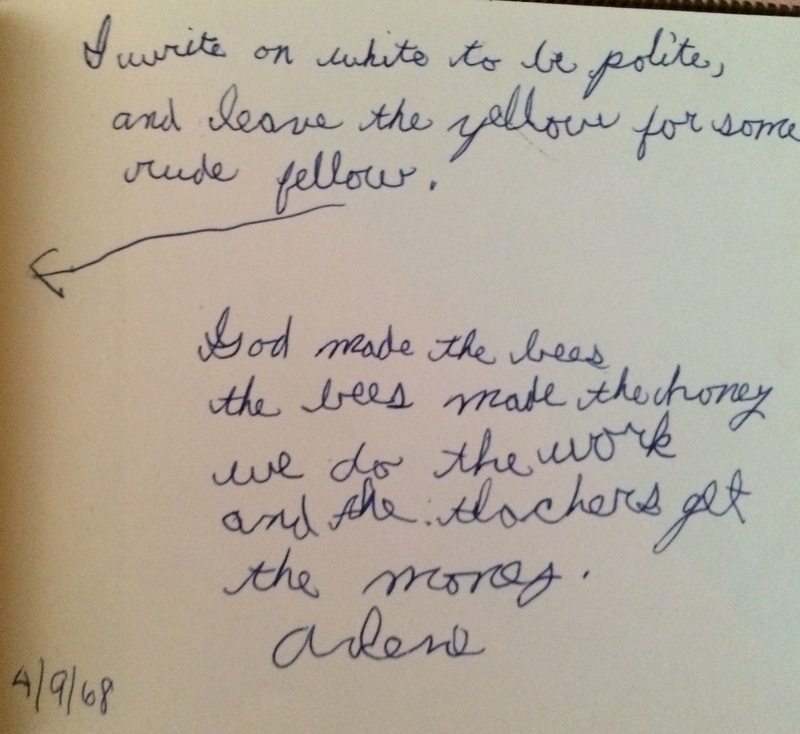 I believe some of the less-friendly little ditties were not serious in their negativity, because no one who wrote in my book were my seventh-grade enemies. 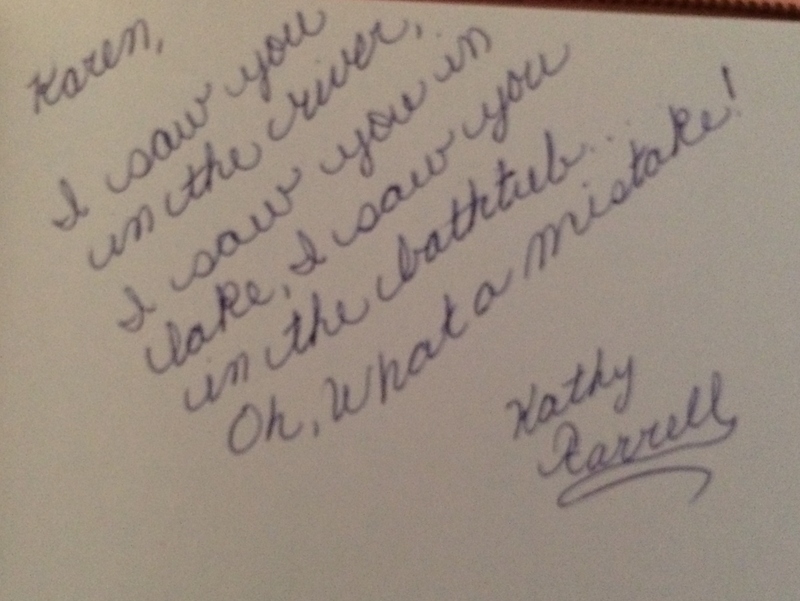 This next one was written by my friend, Ruth, who ended up buying my grandma’s old house. 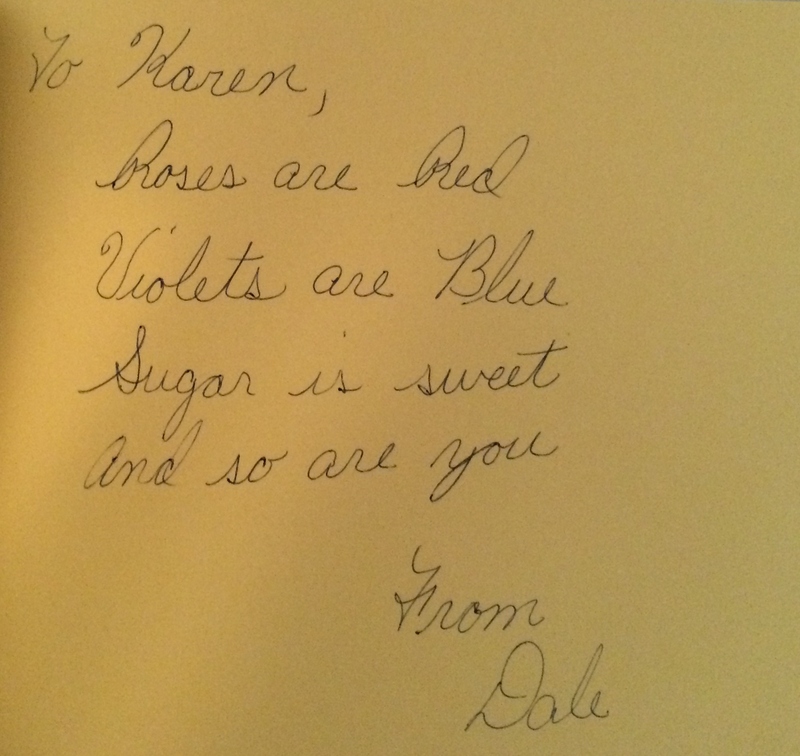 The final “ roses poem” was not altered at all and was written in it original form (actually not really true) by my friend Dale, who was Jamie and Kelly’s gymnastic teacher at the YMCA. So there you are. 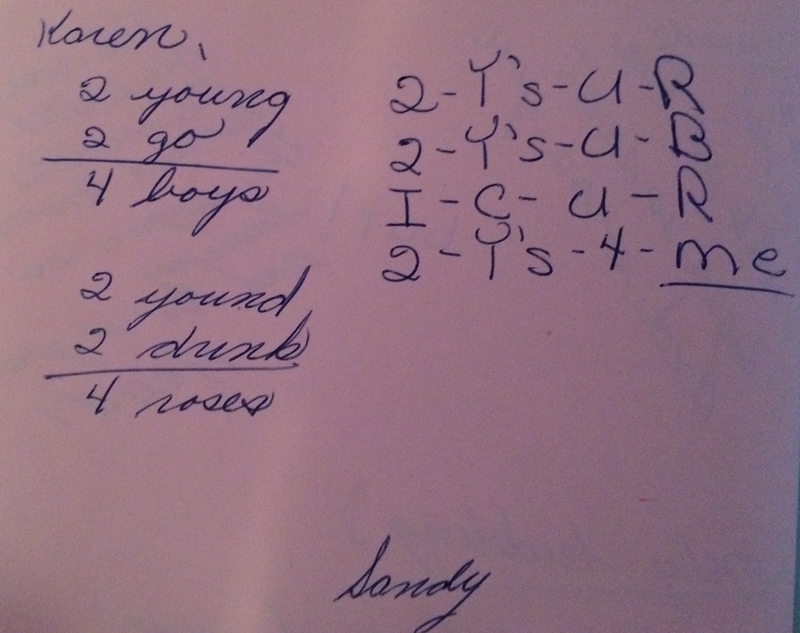 Can you agree that little changed between the time Grandma’s pals wrote in her book and my friends wrote in mine? Also, now you are all ready for “Roses are Red” trivia. Next, I will reveal the rest of the posts. What did you think about and worry about when you were ten? You all had the same fifth grade teacher who you all liked. Did you worry about school, did you think about current events, did you think about your future careers, or did you and your friends talk about love, marriage, and children? 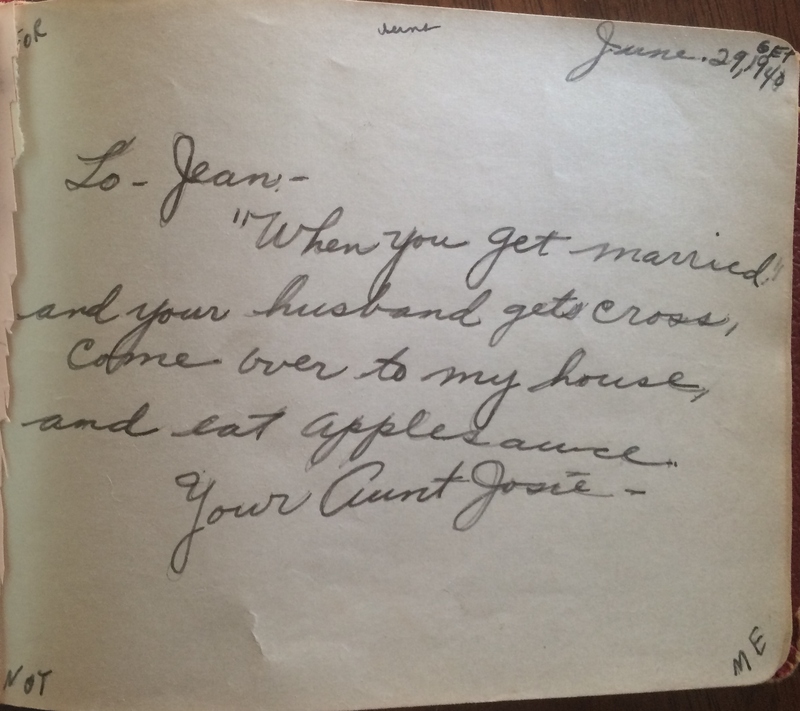 In 1940 and 1941, Grandma and her friends wrote primarily about their future as wives and mothers. Are you all horrified that this topic consumed more pages than any other subject? 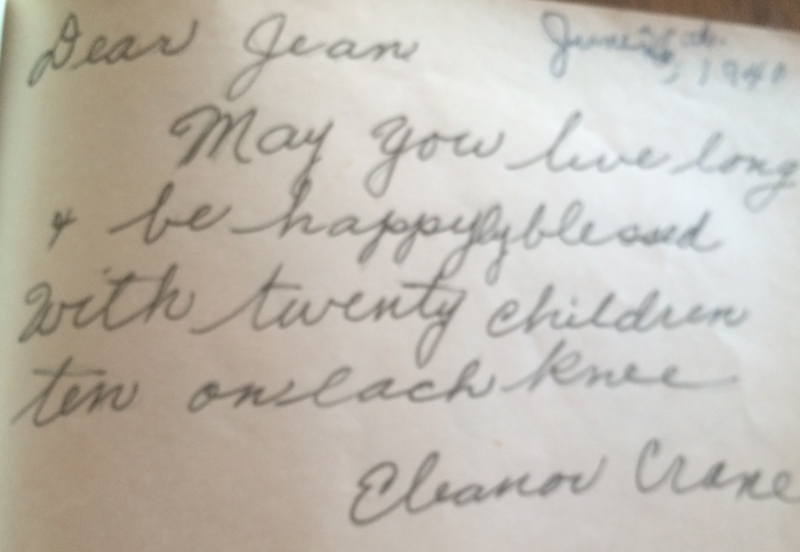 I need to do Eleanor Crane’s family tree and see just how many children she ended up having. Fortunately, Grandma ignored that advice. Undated: Aunt Ar just can’t keep her paws from Grandma’s book. Lucky for her, she grew up to be the best daughter of us all. 2 weeks later/ Mr. and Mrs. This is a classic. I believe I used to jump rope to this cute little rhyme. This is a shocking statement, based upon their ages! Oh, Mom! Did you know what a poor example you are setting for your future grandchildren? There they go again! These fifth graders are certainly interested in drinking! Little did these innocent children know that just 6 months lafter these words were written, many of their older brothers would be going off to war. I will discuss at a later date, all the boyfriends Grandma had as a high school student just four years later. Based on this book, it is not at all surprising. 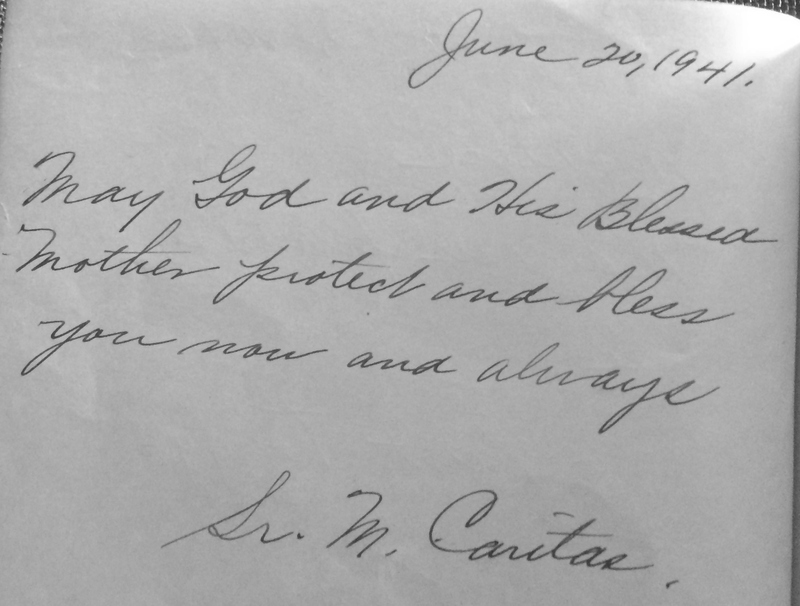 June 20, 1941: May God and His Blessed Mother protect and bless you now and always. I will have to ask Grandma if she has any stories about sister Caritas. Some of the nuns she was quite fond of. 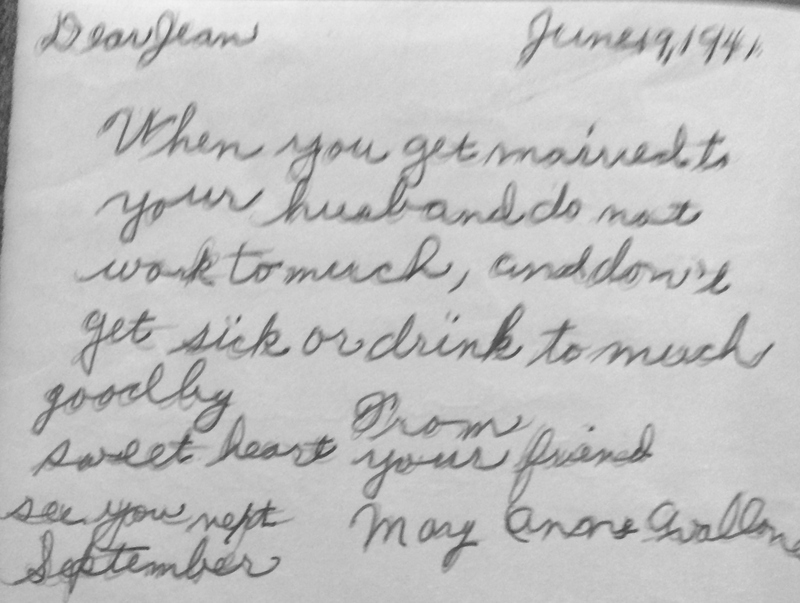 One sent her off to deliver a note to another nun, and I believe that Grandma peaked out it. Uh oh! When these words were written in this book, no one knew how much their world would be changing in a very short time—rationing, war, death. I am glad they had this time of innocence. 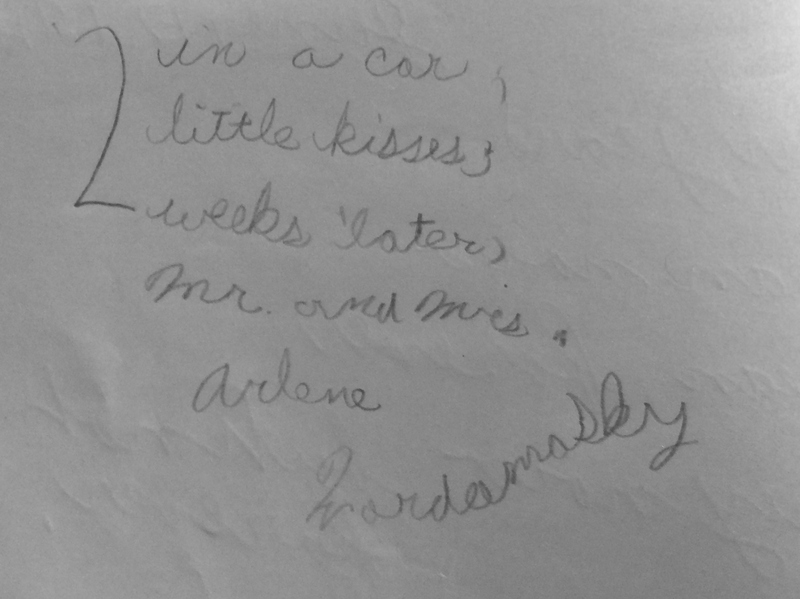 While cleaning my desk I found Grandma’s autograph book, dating back to 1940, when she was eleven years old. 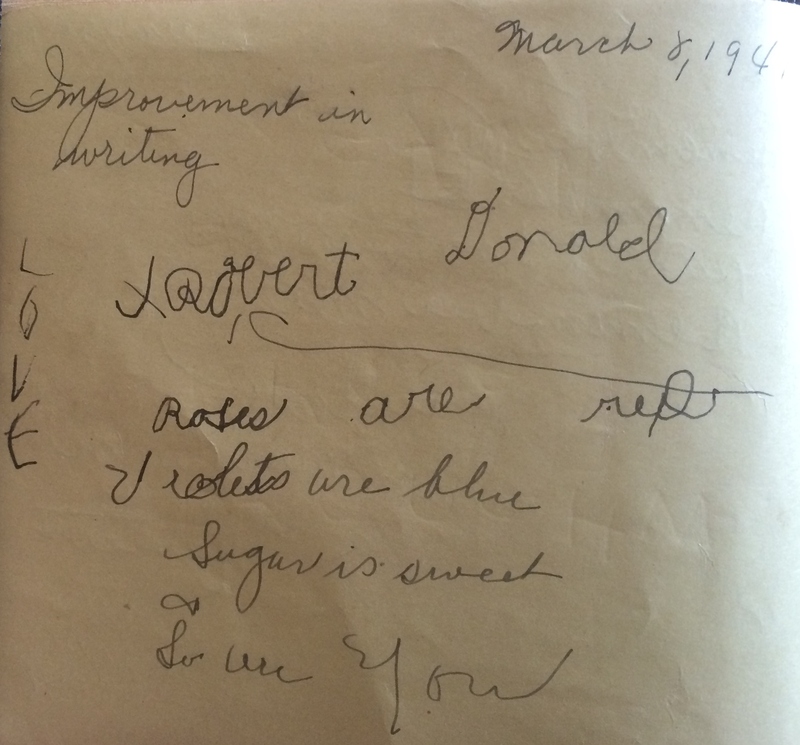 Each entry was filled with the sweetness, innocence, and old-fashioned corniness of the day. 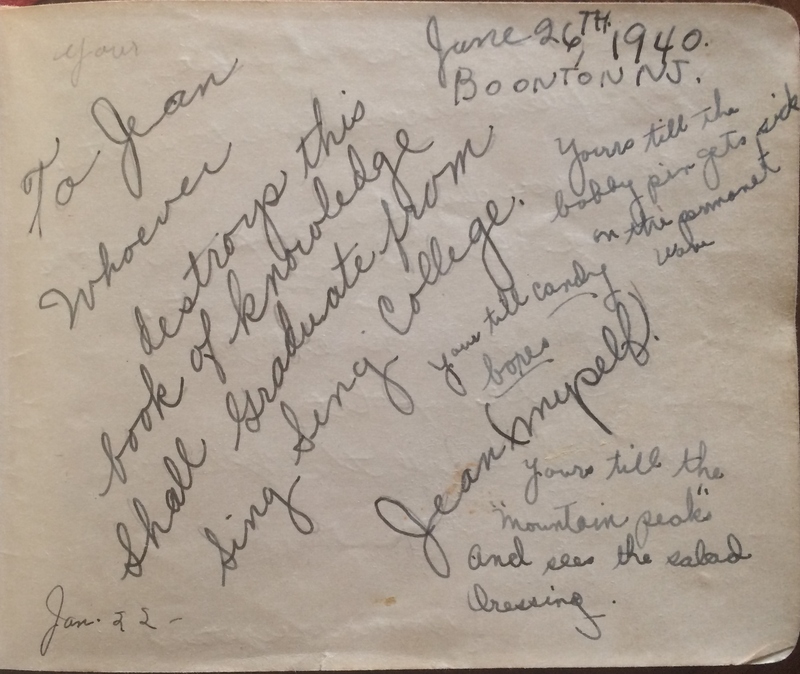 Life was peaceful in Boonton, New Jersey at that time, which was such a stark contrast to events in other parts of the world—the world where Grandpa and his family were living. As I turned each page and read the carefully-worded thoughts of Grandma’s friends and relatives, I could not help but smile. After recording each page, I carefully wrapped it up and sent it to her, hoping that it would cause her to smile also rather than shed a tear for those no longer here. Each page was dated, so I could see that they were not written in order. 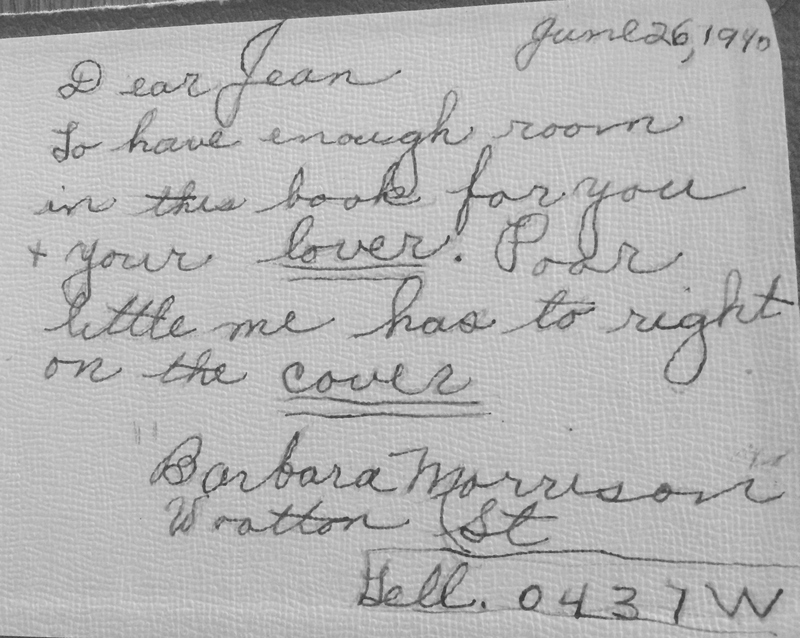 On the bottom of most pages was a second date, which was the birthday of the person signing her little red book. For the next few days I am going to share these pages with you, and when I am able, I will tell you who these people were. You only think of Grandma as how you have known her over the years, but this is a window into her past seventy-six years ago. I will begin with her family. 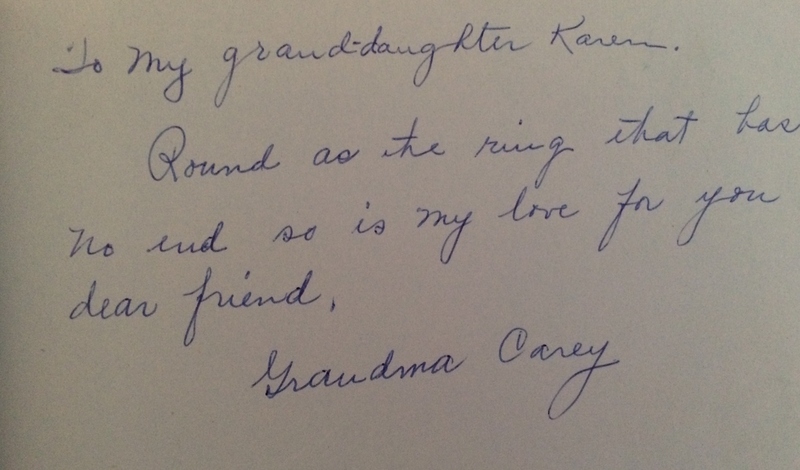 Read what Grandma wrote on the inside cover and you will get a feel of ten-year-old Grandma. I believe “Sing-Sing College” actually refers to the prison known as “Sing-Sing,” which is in Ossining, New York—close to the town where Jamie and Kelly were born. 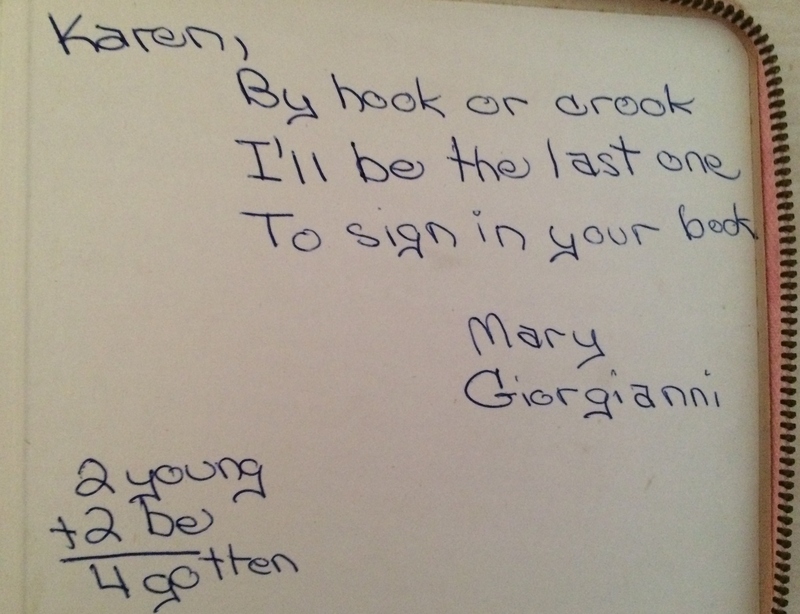 Aunt Tess, who married my uncle Larry six years after she signed Grandma’ s book, was the first one granted that honor. 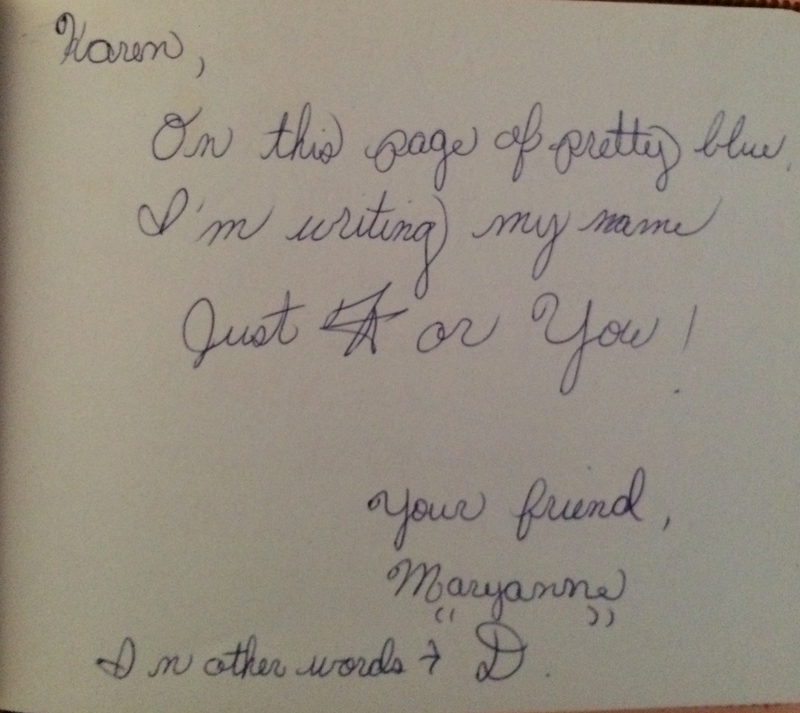 I sent a photo of this page to my cousin Maureen so she could show her ninety-five year old mother what she wrote way back then, and Maureen said that Aunt Tess still writes little rhymes when she sends cards—something she apparently learned from Maureen’s grandmother. 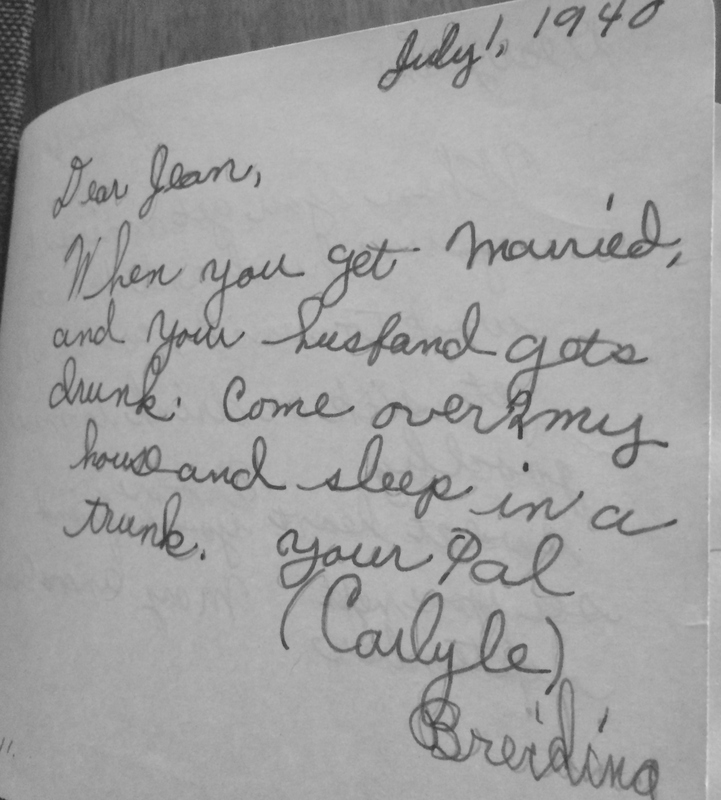 Her cousin Gertrude (the lady with the Christmas houses), provided one of the more serious autographs. 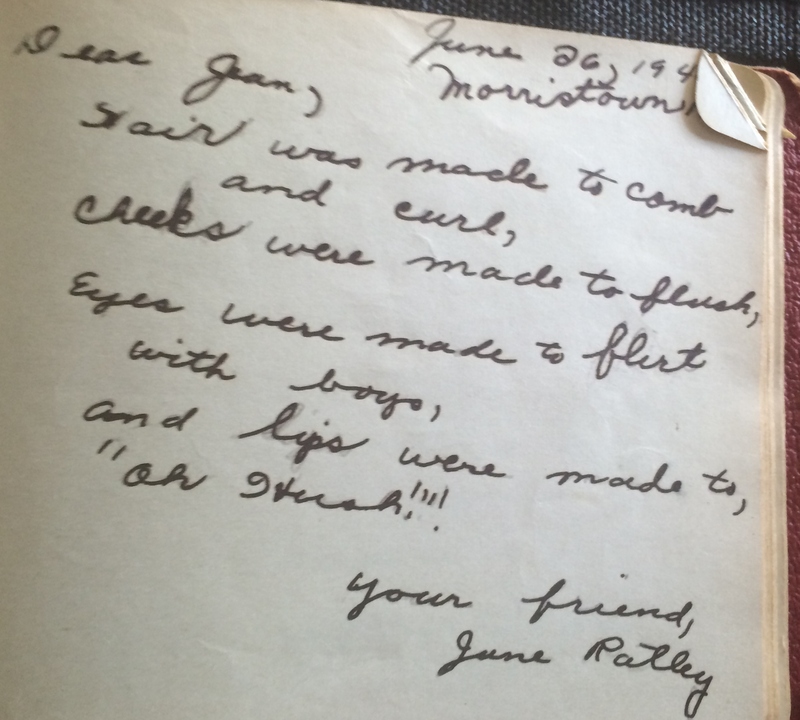 But Gertrude was a sophisticated woman of nineteen, so she could not write something as whimsical as Grandma’s schoolmates did. 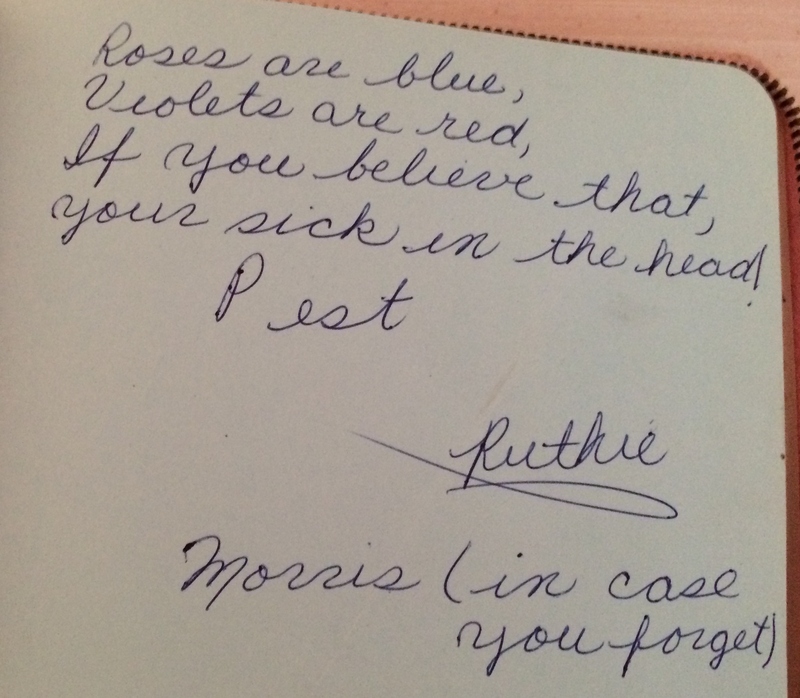 Aunt Marian had written a brief note, but Grandma wanted more. She asked for what she got from her older sister! Her Aunt Josie was my grandmother’s younger sister—ten years her junior. According to Aunt Marian, this aunt had contracted meningitis at the age of two, which led to some mental disabilities and speech problems. 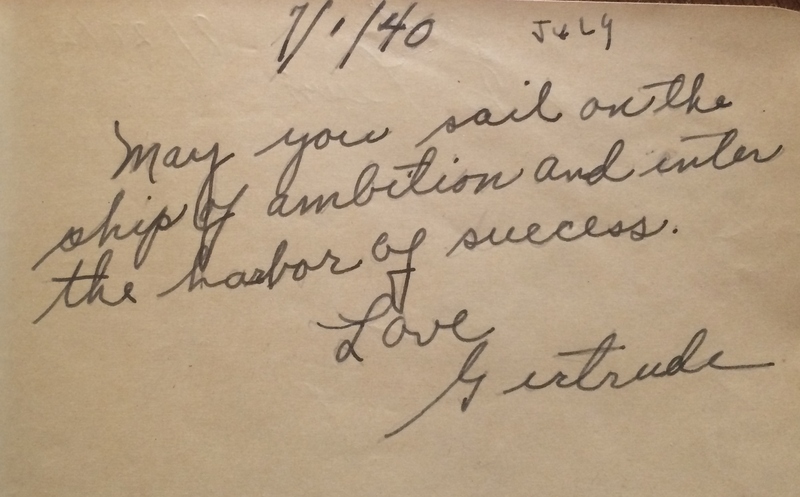 With that in mind, the comment that this thirty-six year old aunt was interesting compared with what her cousin Gertrude wrote. Grandma was very fond of this aunt and worked with her as a switchboard operator. After they divorced, Uncle Leonard moved to Florida and Aunt Peggy remained behind. You have heard about Grandma’s famous Uncle Jack Blue. He served as a pall bearer for President McKinley after serving in the Spanish-American War in the navy. He became a dance instructor, and several of his students went on to become famous in the movies, among them were Ruby Keeler, Bing Crosby, and Katherine Hepburn. His middle daughter, Juliet, married a well-known Columbian singer who appeared in movies here in the U.S. 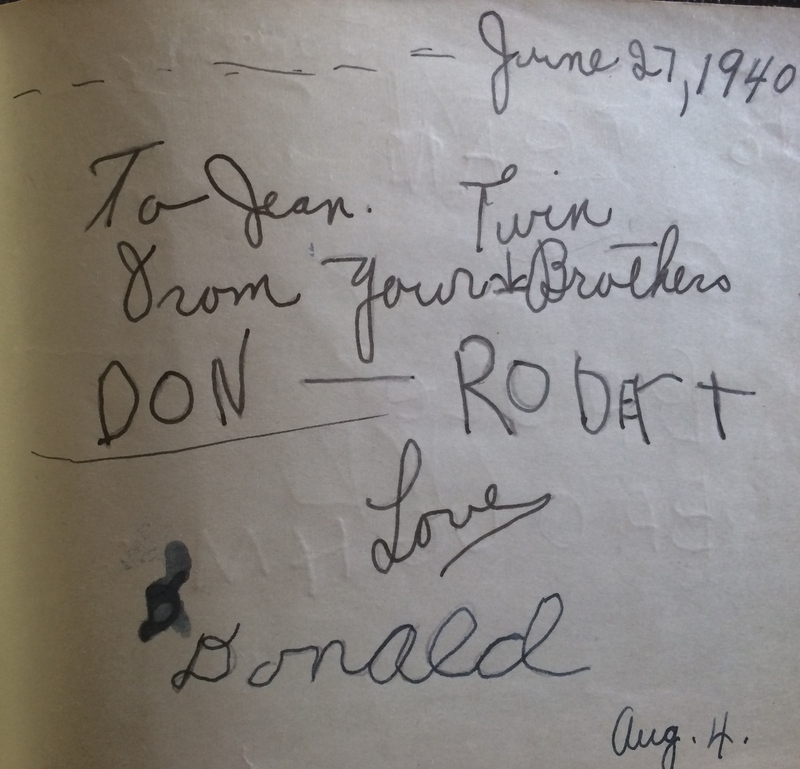 I will close with Uncle Bob and Uncle Don, who wrote in the book when they were not yet six. I am impressed that they were writing in script at this young age. 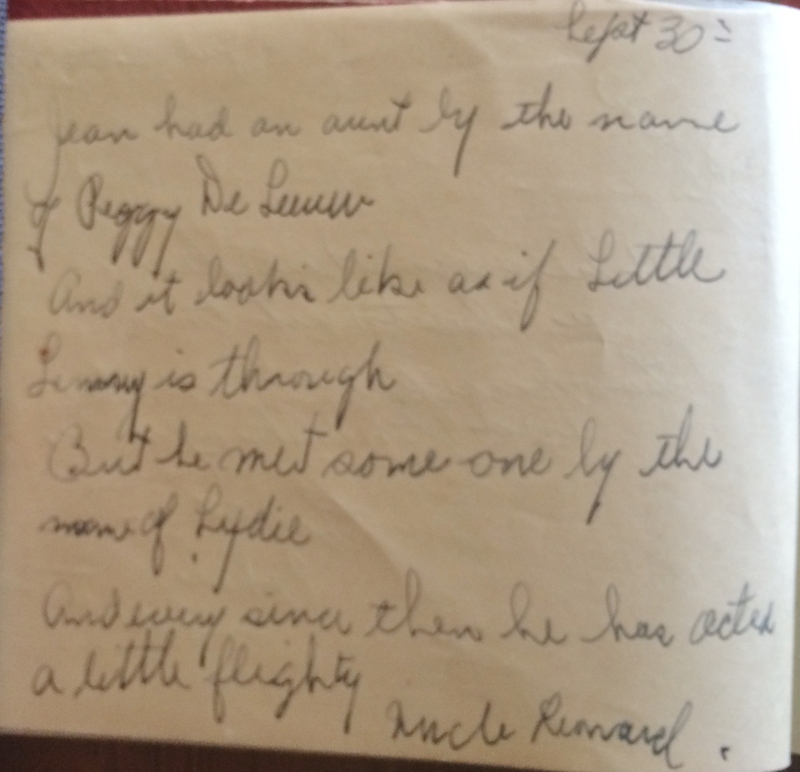 It looks like someone helped them finish the poem the first time, and there is a comment about how their handwriting improved. 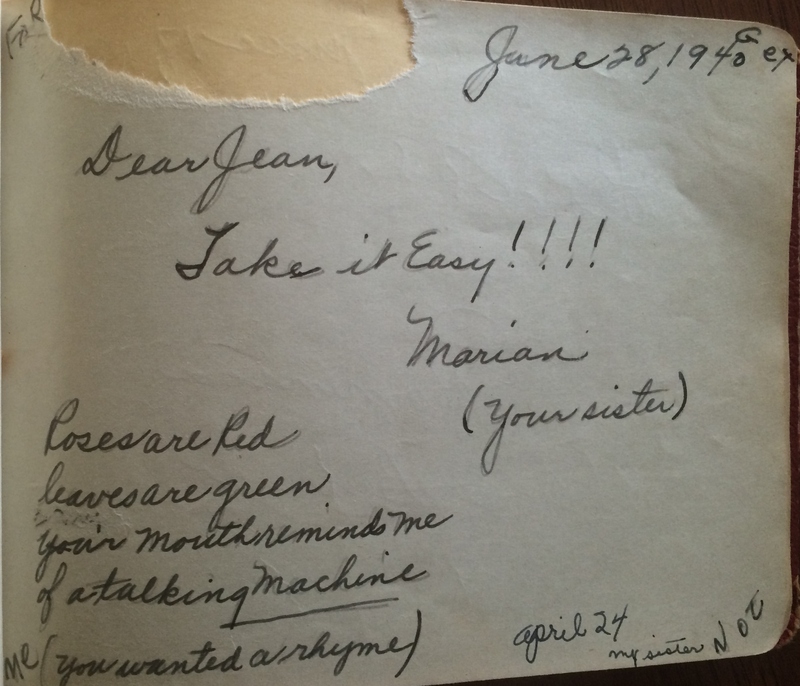 Was it Aunt Marian or my grandmother? So there you have it—your first peek at my mother as a fifth-grade student at Mt. Carmel School in 1940.